The "brain" henchman of Lucinda, aged 25. 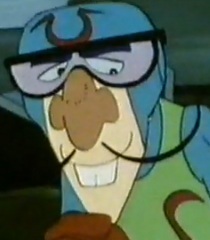 He used to work for Dr. Kieda under cover, therefore he's usually employed to build a new and different mecha in each episode to encounter the Time Bokan used by the heroes. He is cunning though quite prone to making silly mistakes on the machinery (most of which became the key issue of the villains' misfortune throughout the episodes). His name is derived from the Japanicized word for "grotesque."